I have discovered a great place to find coupons without having to buy additional newspapers or paying a clipping service (which I am not really comfortable with personally). Our town has an awesome recycling center that is well-visited and full of clean, untouched coupon inserts! After saving a small stack from recycling, I decided to go back to Walmart, Dillons, and Target for three quick trips, in order to take advantage of expired coupons nearing the end of life at Dillons (14 days after expiration) and others nearing expiration at Walmart and Target. I LOVE these for outing with the boys. They fit in my purse without being bulky or making a wet mess! 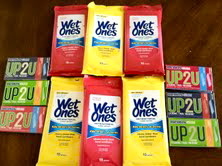 Watch for printables on these from Coupons.com and Target, as they are available frequently for stacking!